For fans of the children’s classic Alice’s Adventures in Wonderland, there’s Curiouser and Curiouser, an oft-repeated phrase from Alice as she meets many unusual creatures in Wonderland! 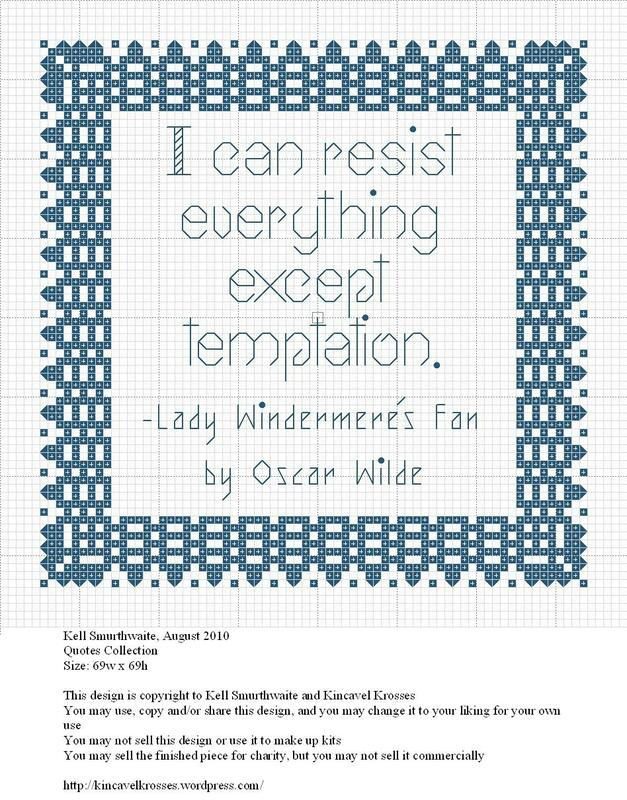 If Oscar Wilde’s wit tickles your fancy, there’s I Can Resist Everything Except Temptation from Lady Windermere’s Fan. 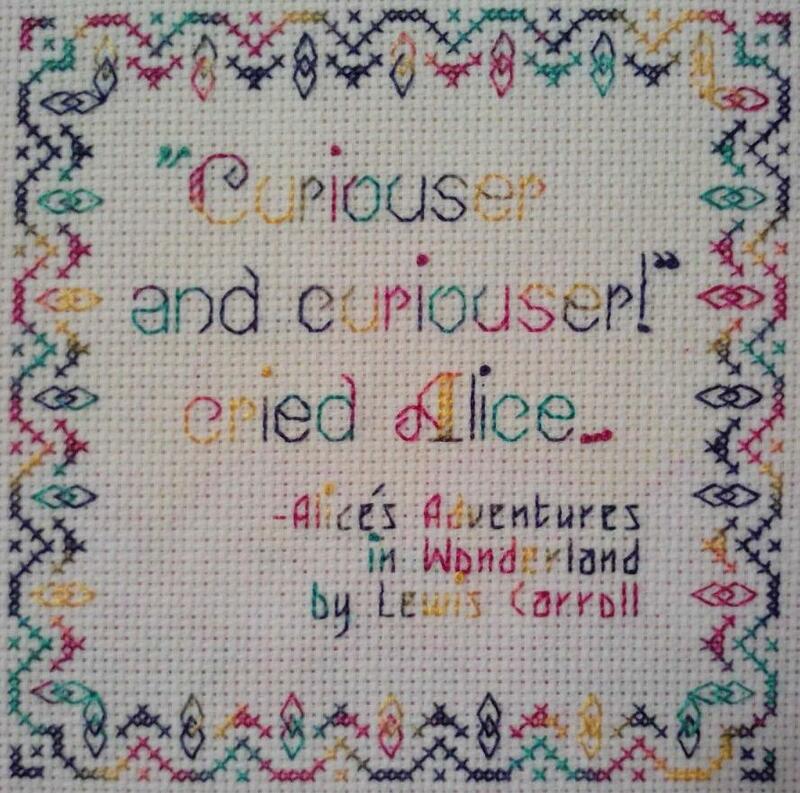 Simple and pretty, this is just the quote and a border – a companion piece to Curiouser and Curiouser. 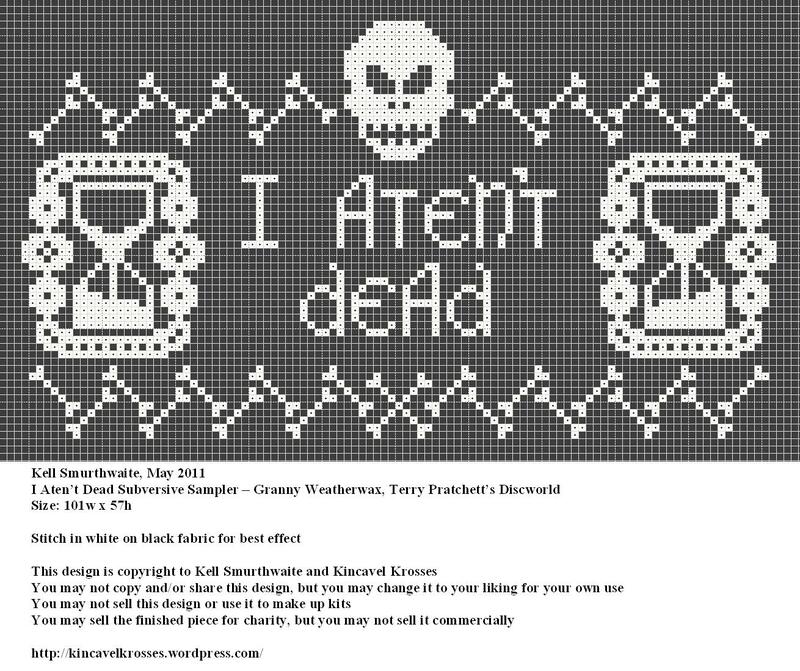 And finally, if you’re a fan of Terry Pratchett’s Discworld series and love Granny Weatherwax, then the I Aten’t Dead Subversive Sampler is for you! Anyone who has read the Discworld novels will know that Granny Weatherwax is careful to wear a sign bearing this phrase when she goes “borrowing” to make sure nobody accidentally buries her while she’s “out”. The skull and bones border has a life timer on each side to complete this little subversive sampler which would look great stitched in white on black fabric. I plan on designing many more charts with literary connections, and I hope you will enjoy them all. 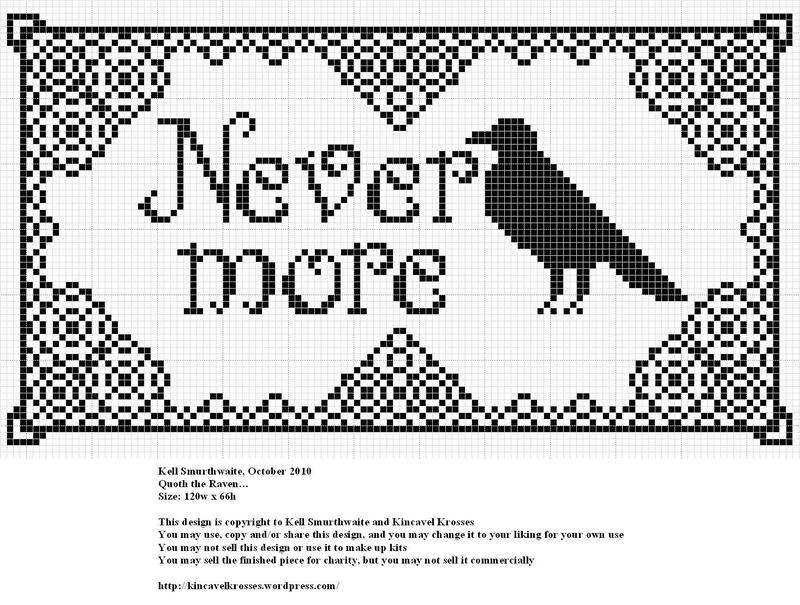 This entry was posted in Crafts, Freebies, Memes, Pastimes, Stitchy Saturdays and tagged Books, Crafts, Cross Stitch, Cross Stitching, Discworld, Domestic Goddess, Freebie, Kincavel Krosses, Literature, Memes, Oscar Wilde, Poe, Pratchett, Quotes, reading, Sampler, Stitchy Saturdays, Subversive Sampler. Bookmark the permalink. I AM a fan of Terry Pratchett’s Discworld series and do love Granny Weatherwax. Your stitching definitely does justice to the grand dame!